Having said that, the 702 and the 724 have disappeared from the Green Line web site. Looking at it, I hadn't realised there were so few Green Line services left. Just the 755, 757 & 758 listed on the Green Line Site. 724 if it is still Green Line is on the Arriva site instead. ..and they now consolidate their presence going south of the town. Reading Buses and Stagecoach South today (February 15) confirmed agreement for Reading Buses to acquire part of bus route 7 which currently operates between Aldershot and Reading. 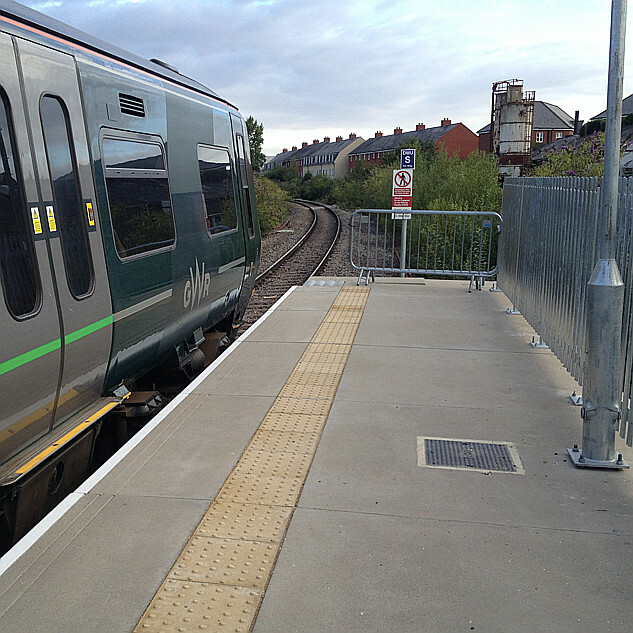 From Monday April 16 Reading Buses will operate the route between Reading and Hartley Wintney, continuing direct into Fleet for onward rail connections. Stagecoach will continue to operate the southern section of the route between Hartley Wintney and Aldershot with most journeys continuing to provide a through link by buses that are timed to connect at Hartley Wintney. Plans are being finalized for through tickets to be available. Both operators confirm there will be some minor timetable changes to their respective sections of the route and full details will be available soon. Existing Stagecoach season tickets will continue to be accepted by Reading Buses until their expiry. Beyond Three Mile Cross the Reading Buses route 7 will become part of their ‘Simply Network’ fare zone with seven day tickets available for £20 and 30 day tickets for £75 (£16 and £61 for under 19s) both online and on the Reading Buses smartphone app. The deal does not involve the transfer of any employees, but does include the sale of two Stagecoach vehicles. Martijn Gilbert, Chief Executive Officer of Reading Buses, said today: “The northern part of route 7 is a great fit with the Reading Buses network. Its acquisition will harmonise the current arrangement where we are the operator of evening and Sunday journeys at the Reading end (under contract to Wokingham Borough Council), meaning that we will be able to provide a daily coordinated service to many customers. “As the Reading travel to work area continues to grow with new housing and other amenities coming on stream, it is important that areas such as Three Mile Cross, Swallowfield, Riseley and Fleet are connected to Reading with good quality and integrated local transport. In the light of this latest announcement I have amended the title of this topic. I wonder if Reading Buses is getting to the point where it is biting off more than it can chew. A lot of money spent on two door buses they are having trouble using sensibly/safely. With the financial state of Reading Borough Council, does all this expansion make Reading Buses more or less attractive if it is sold off. But note that Reading is one of the small number of areas with a rise in bus miles http://www.bbc.co.uk/news/uk-england-42749973. Next week the Route 17 bus route gets Red Route status, then the two door buses might start to live up to their potential. Fundamentally bus services have become less popular as journey time reliability has fallen, reducing stop dwell time will help, better enforcement of bus lanes, bus gates and so forth will also work. I'm always puzzled by how little Reading Buses trust their customers, the principle of enter via one door and exit via another works well except apparently in Reading where randomly the bus company have decided that its unsafe to open the second door at some random list of stops ... thus any time saving is lost. Given London uses buses with up to three doors at all stops and in Europe four sets of doors are common I've yet to see any good reason for their "safety" argument. thus any time saving is lost. Even worse, numerous occasions I have seen people waiting to get off the middle doors and then realise they won't open and have to make way towards the front, by which time people are getting on which infact delays the journey instead of saving time. I asked RB about the use of the middle doors a few weeks ago in relation to them sometimes opening and at other times not. Still yet to see any evidence of announcements. Some bus stops do have shelters in the way of the middle doors if the bus stops at the correct location so I can understand it for some stops, others seem not to make sense, and it also appears to be which driver you get. They'll be painting the town red from Monday. Well Kings Road at least. Not for free, I am afraid, but appears to be about reaction of passengers to bad weather and the resilience of public transport (rail & bus). Uses data from the new generation of on-board ticket machines. When I get round to reading it I will try and put some notes here. I am not rivaling the $38, unfortunately typical for most academic journals. 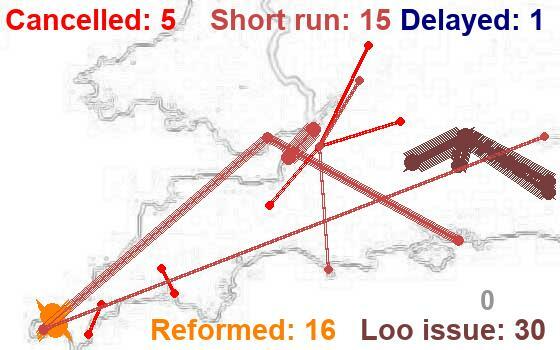 Wind impacts on rail transport summaries briefly the general and local effects. Notes large usage of Reading station and various routes involved and reports of trees blocking trains to Paddington, Didcot, Bedwyn & Wokingham/Guildford. For Reading Buses, which provide 95% of services in Reading they had data for routes 17 (cross town, but looked at east), X4 (Reading, Wokingham, Bracknell) & 500 (Winnersh Park & Ride). Compared data with the following Thursday. Found less use of concessionary passes, small differences in route 17, higher usage of X4 (out of town service) probably related to trees on Bracknell & Guildford lines, increased outbound usage of 500 (Park & Ride). Interesting, but not earth shattering. In my experience, when storms bring down trees they are as likely to block the roads as the railways. I can remember at least one day when I tried three roads from Wokingham to Reading and all were blocked. Getting to the motorway would avoid that of course, provided you found a clear route to it at the Wokingham end. Part of the reason for that is that there are still a lot of big old oaks along the roads around Wokingham, and it's hard to predict which are vulnerable to too much waggling about. For some reason they always fall towards the road - but that's probably as well for the owners of the houses they would otherwise fall onto. Reading Buses announce they are pulling one of the routes they took over in East Berkshire at the end of January due to competition from Courtney Buses. It is with some regret that we have to announce that we will be withdrawing our Thames Valley route 2 from end of service, Saturday 5 May. We stepped in to run this route at short notice after First deregistered their service as it wasn't financially viable for them. We saw a great opportunity to help grow the service and encourage more people to travel and therefore make the service sustainable. Unfortunately another bus operator also registered a service on this route and has the added benefit of a number of other services in the area which are Council/Heathrow funded contracts, meaning they can use these other services to run the route more efficiently in that area. The market is, unfortunately, not big enough for two bus operators and we did not set out to have an ’on the road’ competitive situation. To this end, as mentioned above, we will no longer be running our Route 2 after end of service Saturday 5 May. Courtney Buses will continue to run and provide an alternative service. However, it's not all bad news! We will continue to operate between Windsor and Slough and are re-deploying our Thames Valley route 2 resources to enhance our Green Line service! We will be offering a new Bracknell - Windsor - Slough - Heathrow Green Line 703 service daily, from Tuesday 8 May. This new route will work in conjunction with Green line 702 to provide a combined half hourly service between Langley, Slough, Windsor and LEGOLAND Windsor Resort® daily. We hope to see you on-board our Green Line 702/703 services from the 8 May. We will, of course, continue serving Dedworth to our usual high standards until our withdrawal application takes effect. Weekly tickets won’t be sold after 30 April. Thank you for your continued loyalty and custom in the meantime. Never been as visible as his predecessor, never seen him out on the street. Reading Buses to take over Henley town services. A NEW bus service for Henley will start on Monday, August 6. Reading Buses will run services from the town centre, replacing Whites Coaches’ 151 to 154 routes. The new service run from 7am to 7pm every weekday compared with the current times of 9.30am to 2pm and the exact route and times will be announced shortly. Members of the town council’s bus working group will work with Reading Buses’s marketing team on how best to promote the service.